Contemporary Worship at 8:30 am is a contemporary band-led worship for with a straightforward message that can apply to your life. Sunday Morning Traditional Worship at 10:15 am is a great way to ease into your Sunday. Enjoy familiar hymns played on a church organ, hear a choir of heavenly voices sing the hymns you know and love and enjoy the mellow richness of our handbell choir. Reconnect with tradition at the Sunday Morning Traditional Worship. Sunday School starts at 9 a.m. and runs to approximately 9:50. Children are dismissed to Sunday School following communion during the 8:30 a.m. worship service. Sunday School is for children Pre-K through grade 5. We have so much fun during Sunday School from interactive lessons to monthly themed parties; your child will feel fulfilled and enlightened each Sunday. The children pre-k through grade 5 practice during Sunday School for Youth Sunday, which is the 2nd Sunday of each month. All children will remain in worship for the duration of the whole Contemporary Service on Youth Sundays and there will not be Sunday School. We hope that you will be just as excited about engaging in worship as families on these Sundays. Each week our children donate money to support Erick, a 9 year-old child who lives in Bolivia and is sponsored through World Vision. We have been learning about his life and telling him a little bit about ours through letters. It is always an exciting treat when we receive a letter from Erick. He has become a part of our Sunday School and all the children know him by name. Elements of Sunday worship include scripture reading, prayer, music, hymns, a "message" or sermon, a children's message, the Lord's Supper and can include many special experiences. Some examples of special worship experiences include welcoming new members, baptisms, the blessing of the driver's license (where we ask for the safety of our new drivers), confirmation, and celebrations of church holidays. Mid-week worship is also offered during the Lenten and Advent seasons, with worship at 7:15pm. Giving your child the foundation of faith is an important part of developing a spiritual life in Christ. At Christ Lutheran Church your child can participate in many programs designed to build that foundation. Click on the link to the right to read more. Children’s Church takes place during the worship service. Following the Children’s Message, children ages 3 through 8 are dismissed with the adult leader to the Fireside Room. Children’s Church takes a slightly different approach to Christian Education than our Sunday School classes. Elements of the actual worship service are introduced and explained in age-appropriate ways. A brief lesson based on one of the Sunday scripture readings is also included. Sunday School time also includes Sunday School Youth Choir. The kids practice during Sunday School for Youth Sunday which is now the 2nd Sunday of each month. The Sunday School children will be singing on Youth Sunday each month. All children will remain in worship for the duration of the whole Contemporary Service on Youth Sundays and there will not be Sunday School on Youth Sundays. We hope that you will be just as excited about engaging in worship as families on Youth Sundays. An instrumental choir opportunity for adults is our Handbell Choir. 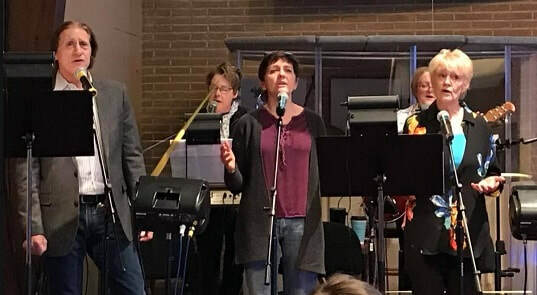 The choir practices once a week, enhances our church services approximately once a month, and enjoys playing at events in the community year-round. Bell Choir rehearsals are on Tuesday's and continue throughout the year. Handbells always seem to add special emphasis during the holiday season. The CLC Handbell Choir played at the annual Christmas Walk. ​Music at Christ Lutheran Church is an important part of the worship experience. All adult, beginning with high school young adults, are welcome to sing in the Senior Choir! The choir sings a large range of music, from classical to contemporary, and performs most Sundays during the year excluding summers. No experience necessary, just a love of singing! Worship at Christ Lutheran Church offers a variety of styles. The Band takes a modern approach to creating music and song. Drums, keyboard, bass, guitar, and a bunch of talented singers lift up the 8:30 contemporary worship service with their gifts. The Band not only helps lead worship, but they also travel to neighboring churches to share their gift of music. Grounded in prayer, members of The Band support each other musically, professionally and personally.